This is another problem because the "Save Settings"
are so close to each other and it is understandable why sometimes careless bloggers accidentally click on the wrong button. Previously, when a blog is deleted, the blog URL is released to others to grab. In the past this had led spammers to grab the blog URL to take advantage of its history, that it had already been indexed by search engines and also probably because the blog also have respectable Google PageRank. In fact, many suspect these spammers have robotic programs to grab a blog URL the moment it got release to everyone. The blogs they set up are referred to as spam blogs or splogs. The old advice was Why you should not delete your blog or change its URL (click BACK button to get back to this page). This no longer apply to blogs you delete yourself as they are reserved for you to claim back later. However, it is still applicable if you change the blog URL as then, the blog URL is open to everyone to grab, including spammers, and if you have been giving the blog URL to family, friends, colleagues, etc., it can be very embarrassing if the spammers put pornographic material into the blog as that blog is still associated to you in their mind. The first step should be to try to contact Blogger Support (click BACK button to get back to this page). There is another old post Contact Blogger Support old post. Both had to be edited many times as Blogger Support keep changing the goal post. The latest is that you should only contact Blogger Support regarding for account or TOS-related issues. Wonder if deleted blog is included in these issues. Will try to find out. For other problems, and probably also for deleted blogs which you want to claim back, post your problems to Google Blogger Help group. Try to catch the attention of one of the Blogger Employees and if they see your appeal for help, they can help you get your blog back. Remember to give your blog URL. See Asking for help: Some advice (click BACK button to get back to this page). This is a frequent question. Why is it when I click on an image (photo, screen shot, etc. ), it does not enlarge and how do I make it enlarge? I was told that if you upload a photo or image in the Blogger post editor window COMPOSE mode, and you drag and drop the photo or image, it will result in exactly the above problem. I myself practically never use the COMPOSE mode, always the EDIT HTML mode as it gives me more control over my blog posts plus allow me to do things I cannot do in the COMPOSE. Further, using the COMPOSE mode will introduce lots of formatting tags which I don't want in my posts. So I myself practically never use the COMPOSE mode and have never come across that problem myself. I have yet to test it at Testing Blogger Beta (now New Blogger) to see if it is true or not. However, if this was your experience, hope you will give us some feedback by leaving a comment. What I normally do is to highlight the whole script, right-click, select copy, scroll down to where I want the photo and paste it there. Within the script, there will be alt="" added. This is for your convenience so that you can type within the double quotation marks something about the photo. 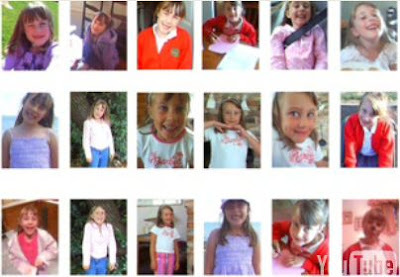 For example, the above are photos of a missing girl in Australia, so I edit it to alt="missing girl photo, Savannah-Jade". This is so that search engines knows what that photo is all about. Search engines cannot read photos, so this is good for SEO (search engine optimization) purposes. Also, if ever for some reasons the photo cannot be displayed, instead of a blank box, your visitors will see a box with the text "missing girl photo, Savannah-Jade" in it. In addition, I will highlight t="missing girl photo, Savannah-Jade", press ctrl+C to copy it to clipboard, move the mouse cursor and click at the position just before the backslash / almost at the end of the script. To make it comply with the W3C validation, I will have to create a space between the above and the backslash. Then I will change t=" to title="
Try hovering your mouse over the above and confirm that a tool tip will appear. Now remember, the original script is still at the top of the post, so if don't do anything else, you will end up with 2 identical photos in the post. Once I have confirmed that everything is OK, I will then scroll up to the top of the post and delete the original script. The reason why I follow this ritual is because I don't want to cut, paste, edit, and then find there is some problem. When that happens, I may have to upload the photo all over again. By following this ritual, the original script will always be there waiting for me if ever something went wrong. Note the above photo is taken from Missing girl: Please help. It will be great if you can help circulate the above link (right-click on the link and choose "copy" and paste the link to wherever you want, be it an email or a message in Facebook, etc. Search engine optimization (SEO) is what one do to try to increase the traffic (visitors) to a blog or website. It can be on site SEO (done in the blog or website with proper use if keywords, placement of keywords (many says it is best to put the more important keywords near the beginning and end of a post or page), incorporating keywords in the blog or website URL and also the blog title and post titles (permalink). Off site SEO does not involve the blog or website itself. SEO practitioners try to get as many inboud links (links pointing to the blog or website) as possible, thus increasing link popularity, PageRank, search engine visibility, etc. Getting more traffic can also be divided into 2 - organic (free via search engines and inbound links) and inorganic (you will have to pay for the extra traffic by advertising either online or offline). Many uses online advertisements using the most cost effective way - Google AdWords which you can get via the text link that says "Increase traffic to your website. Get Google AdWords" at the top of the right sidebar of Computers, Internet and SEO (Search Engine Optimization) near the bottom of the right sidebar. Now you as a blogger can either try to do the Search Engine Optimization yourself or get one of the resellers of private label search engine optimimization to do it yourself. Or perhaps you have a blog like Guide to United States of America, you might be interested in San Diego search engine optimization as San Diego is the United States of America.